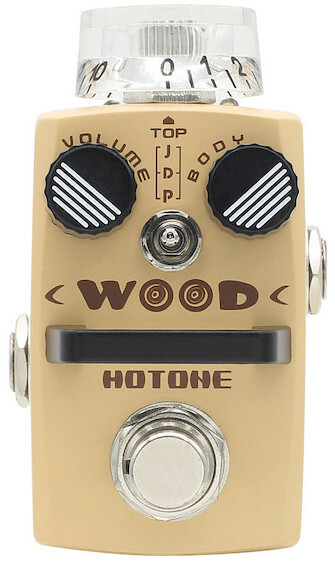 If you are tired of carrying an acoustic guitar along to the stage or studio, the compact WOOD pedal is for you. Its wide adjustable range is enough to turn an ordinary electric guitar tone into a variety of natural, realistic acoustic tones. The 3-way toggle switch lets you choose from J (Jumbo), D (Dreadnought) and P (Piezo) simulation modes; the BODY knob and the TOP knob can further shape your tone.